Once Melloy Dodge had the new Chrysler Pacifica Hybrid on the lot, our team knew this popular hybrid minivan was going to be a top seller just based on the interior features alone. The new Chrysler Pacifica Hybrid is roomier than you might think. Thanks to the Stow ’n Go Seating, you can quickly and easily fold down the second or third-row seats right into the floor, instantly making plenty of room for all your groceries, luggage, or sports equipment. Whether you are traveling with your large family or carpooling to your job, seating is never an issue with the Chrysler Pacifica Hybrid. 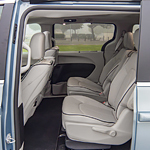 With up to 243 possible seating configurations, your hybrid minivan can quickly have enough room for passengers or cargo alike. Another unique interior feature, the Chrysler Pacifica Hybrid comes with the Stow ’n Vac integrated vacuum, meaning you can make short work of messes in the cabin instantly.